Every time you stop breathing, you interfere with the normal patterns of deep sleep. The quality of sleep that you get is greatly impaired. Your level of alertness and your ability to pay attention may be seriously affected. This is caused by a temporary airway obstruction. This blockage may be partial or complete. 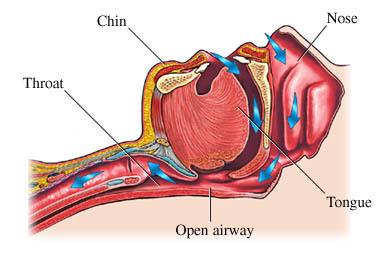 Obstructive sleep apnea can occur when the tissues of your throat relax too much and cave in on each other. If you are overweight, then your excess tissue might be putting too much pressure on your airway, causing it to collapse. You may have a deviated septum , nasal polyps , large tonsils, or an elongated soft palate and uvula that obstruct your airway while you are sleeping. For children, enlarged tonsils and adenoids are the most common reason for obstructive sleep apnea. This occurs when the lower brain stem fails to send signals to the muscles that control breathing. Conditions that cause problems with the lower brain stem include certain types of polio, encephalitis, stroke, brain tumors, and other diseases that affect the brain and central nervous system. For children, the most common reason for central sleep apnea is prematurity. Mixed sleep apnea includes aspects of both obstructive and central sleep apnea. What are the risk factors for sleep apnea?What are the symptoms of sleep apnea?How is sleep apnea diagnosed?What are the treatments for sleep apnea?Are there screening tests for sleep apnea?How can I reduce my risk of sleep apnea?What questions should I ask my doctor?What is it like to live with sleep apnea?Where can I get more information about sleep apnea? Botros N, Concato J, Mohsenin V, Selim B, Doctor K, Yaggi HK. Obstructive sleep apnea as a risk factor for type 2 diabetes. Am J Med. 2009;122(12):1122-1127. NINDS sleep apnea information page. National Institute of Neurological Disorders and Stroke website. Available at: http://www.ninds.nih.gov/disorders/sleep%5Fapnea/sleep%5Fapnea.htm. Updated October 21, 2015. Accessed December 6, 2016. 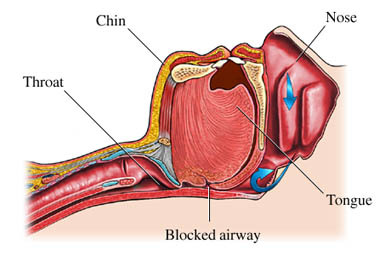 Obstructive sleep apnea (OSA). EBSCO DynaMed Plus website. Available at: http://www.dynamed.com/topics/dmp~AN~T115600/Obstructive-sleep-apnea-OSA. Updated October 5, 2016. Accessed December 6, 2016. Sleep apnea. American Sleep Apnea Association website. Available at: http://www.sleepapnea.org/learn/sleep-apnea.html. Accessed December 6, 2016. What is sleep apnea? National Heart, Lung, and Blood Institute website. Available at: http://www.nhlbi.nih.gov/health/health-topics/topics/sleepapnea. Updated July 10, 2012. Accessed December 6, 2016. 8/11/2015 DynaMed Plus Systematic Literature Surveillance http://www.dynamed.com/topics/dmp~AN~T115600/Obstructive-sleep-apnea-OSA: Molnar MZ, Mucsi I, Novak M, et al. Association of incident obstructive sleep apnoea with outcomes in a large cohort of US veterans. Thorax. 2015;70(9):888-895.